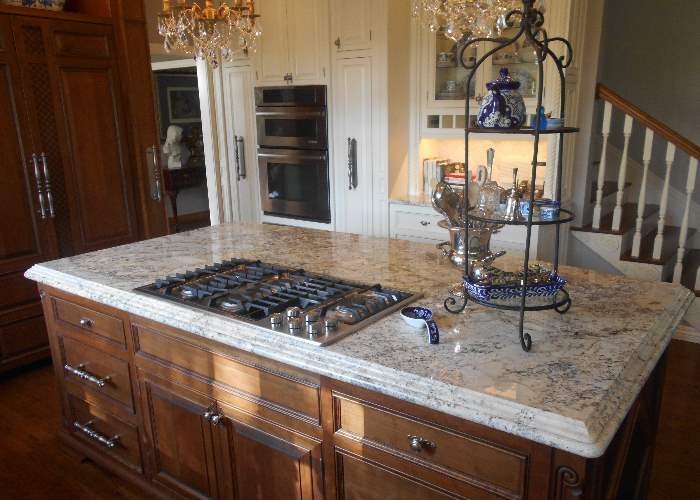 Countertops fabricated from granite and quartz are famous for their beauty and durability. The ability of natural and man made stone to resist scuffs and scratches comes from on it's mineral composition. In 1812, the German mineralogist, Friedrich Mohs, devised a system to classify the relative hardness of natural minerals. On what we now call the Mohs scale a rating of 1 refers to an extremely soft mineral while a rating of 10 refers to the hardest of all minerals. A mineral of unknown hardness can be tested against one of the standard minerals listed below. Whichever one scratches the other is harder and if both scratch each other they are both the same hardness. Granite is rated 6 on the Mohs scale. Engineered Stone because it is composed primarily of quartz is rated 7. 1. Talc: a white, gray, or pale green soft mineral with a slippery feel. 2. Gypsum: a soft white or gray mineral consisting of hydrated calcium sulfate and is used to make plaster of Paris and drywall. 3. Calcite: a white or colorless mineral consisting of calcium carbonate. It is a major constituent of sedimentary rocks such as limestone, marble, and chalk. 4. Fluorite: a mineral consisting of calcium fluoride. 5. Apatite: a widely occurring pale green to purple mineral, consisting of calcium phosphate with some fluorine, chlorine, and other elements. 6. Feldspar: an abundant rock-forming mineral consisting of aluminosilicates of potassium, sodium, and calcium. 7. Quartz: a hard white or colorless mineral consisting of silicon dioxide, found widely in igneous, metamorphic, and sedimentary rocks. 8. Topaz: a precious stone, typically colorless, yellow, or pale blue, consisting of a fluorine-containing aluminum silicate. 9. Corundum: extremely hard aluminum oxide, used as an abrasive. Ruby and sapphire are varieties of corundum. 10. Diamond: a precious stone consisting of a clear and typically colorless crystalline form of pure carbon, the hardest, naturally occurring substance.